If you are a recognised faculty union, assembly or representational organisation you are entitled to this free account. 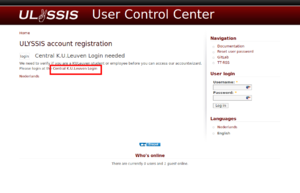 We verify this using the list of recognised "kringen" of LOKO, http://loko.be/verenigingen/ . Recognised organisations are not entitled to a free account. If you are a Recognised organisation by LOKO, Studentenraad KU Leuven or the KU Leuven itself you are entitled to an organisation account, this account has a reduced price. After picking your account type you have to chose what options you want, and choose a username and language. As soon as we have received and processed your payment your account will be activated and you will receive instructions to set a password.